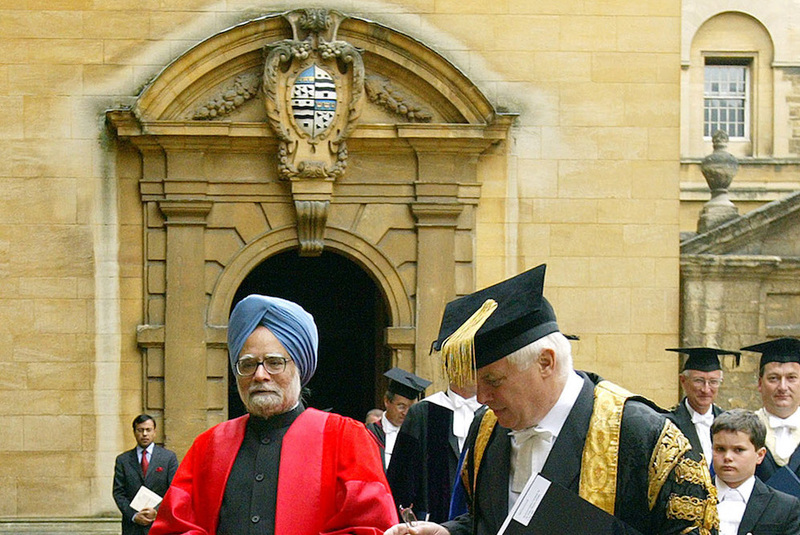 Former Indian prime minister Manmohan Singh (center) walks in a procession at Oxford University in 2005. Photo by Jane Mingay/Associated Press. When Pakistan’s leader, Muhammad Ali Jinnah, appointed new governors for his country’s four provinces, three of his choices were Britons. He even lured Sir George Cunningham out of retirement as rector of St. Andrews University to become governor of the North-West Frontier Province; when Cunningham retired, Pakistan appointed another Scot to replace him. Independence was not, therefore, like the end of empire in other places, with the colonialists expelled and their collaborators rounded up. While many Britons in the 1950s and 1960s forgot about their empire or were perhaps too embarrassed to remember they had ever had one, others were keen to remind listeners that British rule had benefited Indians in numerous ways, “giving” them certain things and “teaching” them others. These “gifts” usually included cricket, liberalism, the rule of law, incipient democracy, the English language, an incorruptible civil service, and (before Partition) the unity of the subcontinent—the welding together of hundreds of little states that has enabled India to become the vast united country that it is today. Naturally, there were many people, usually Indian nationalists and British intellectuals of the Left, who contested this view. Britain’s legacy, they claimed, was exploitation, oppression, and division. The British governed India by employing the Roman policy of divide et impera—“divide and rule.” In any case, the British rule was ephemeral and ultimately irrelevant: The future would regard it as an unimportant interlude in India’s millennial history. No one can dispute the claim that in the 18th century the East India Company made its profits from corruption and exploitation. Nor can one deny that British soldiers were sometimes very violent, especially during the Indian Rebellion of 1857-8. A further charge against the Raj would be the mismanagement of various famines, especially the devastating one in Bengal in 1943. Yet some of the accusations do not stand up. “Divide and rule” was never British policy; nor was the creation of Pakistan. It was the inability of Hindu and Muslim politicians to agree upon the nature of an independent India that led to Partition. As for the physical legacy, it will surely take a long time to expunge the visible traces of British rule, especially as many of its places are still used and inhabited by Indians today: the high courts, the government buildings, the splendors of New Delhi, and the wonderful examples of Gothic architecture (library, university, law courts among them) that survive in Mumbai. And then there are the railways, the focus of much British investment, which continue to knit together India’s vast economy as well as its territory. Indians learned to use British ways and institutions to transform their lives and to create and fashion their new nations. A great early leader of the Indian National Congress, Gopal Krishna Gokhale, was a liberal as a result of his education at Elphinstone College in Bombay. The views of Mohandas Gandhi owed much to British institutional influences, his years at the Inner Temple in London, his knowledge of Indian law, as well as his friendship with British liberals. Jawaharlal Nehru, a liberal both in his political sensibility and in his practice of secular democracy, had been a pupil at Harrow School and Cambridge. Nehru and his colleagues guided Indian nationalism toward that rare phenomenon, an essentially liberal revolution: not communist, not fascist, not military, not even British, but liberal in an Indian fashion. Today, with the balance and perspective offered by the passage of time and the benefit of hindsight, it is possible for an Indian prime minister to assert that India’s experience with Britain had its beneficial consequences too. Our notions of the rule of law, of a Constitutional government, of a free press, or a professional civil service, of modern universities and research laboratories, have all been fashioned in the crucible where an age-old civilization of India met the dominant Empire of the day. These are all elements which we still value and cherish. Our judiciary, our legal system, our bureaucracy, and our police are all great institutions, derived from British-Indian administration, and they have served our country exceedingly well. The setting of the speech reinforced the point: Singh was speaking at Oxford University, where he had earned his doctorate in 1962. Sir David Gilmour is one of Britain’s most admired and accomplished historical writers and biographers. His most recent book is The British in India: A Social History of the Raj.